Saturday was a cold and snowy day. Only one inch of snow was forecasted, but it kept snowing most of the day and in the end we got at least 3 inches. The poor birds sheltered among our magnolia branches, but only because they know I usually stock our feeder with sunflower seeds to the brim. After it stopped snowing, as a special treat, I put out a tray of roasted peanuts to provide them with some energy food. 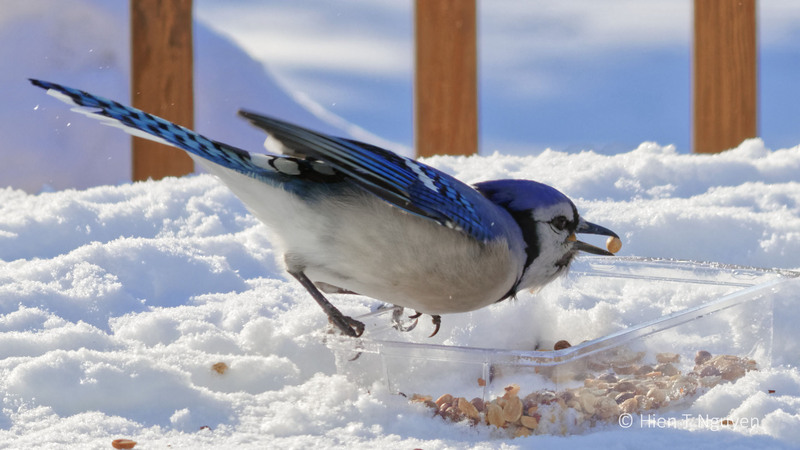 Within a few minutes, Blue Jays appeared and swooped down to literally gorge themselves. Blue Jay, after at least four peanuts down its throat. Wow, what a capture! And you know all the bird’s names. Beautiful birds and gorgeous photos. What extraordinary photos! As if the wee birds are looking at you and asking for help in the midst of the snow. Thank you Sue! Whenever it snows, the birds tend to gather on that tree looking toward the house and the bird feeder. When it is sunny, the just fly in, pick up some seeds then fly out. It’s a smorgasbord for the birds — how very lucky they are! Truly excellent photos, Hien. Thank you Jet! The birds have taught me a lot about photographing them. Thank you Donna! Those birds deserve that food for all the opporutnities they have given us to observe and learn about them. 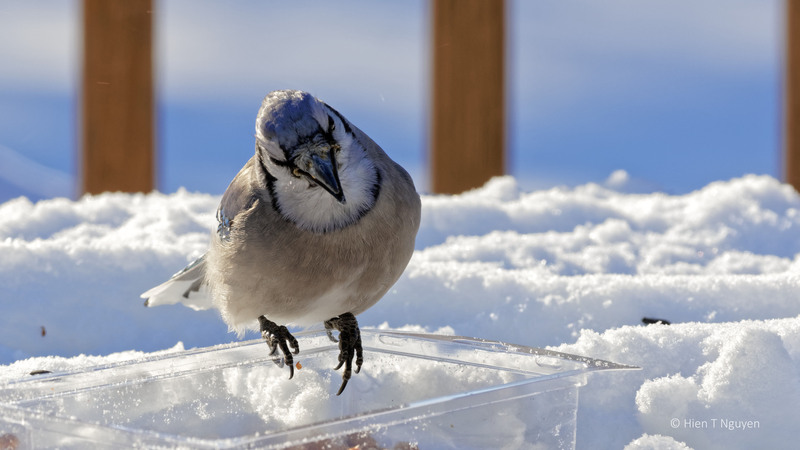 You’re so kind to the birds, putting food out for them when it’s cold. It’s as if they reward you for you kindness by posing for your great photos of them! Thank you Jerry. 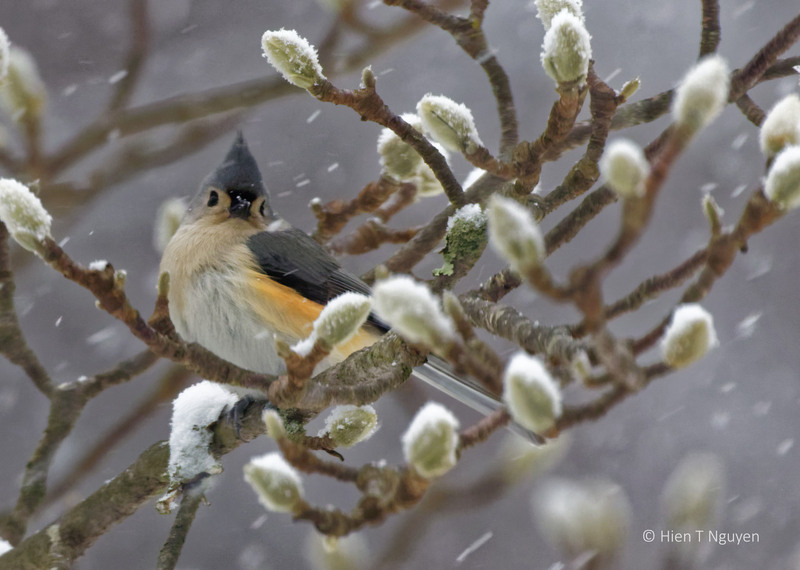 It seems that when it snows and the ground is all white, more birds come to the feeder. I guess they can’t find those worms or seeds that they normally get. Always love your bird photography! Great shots and a great way to bring them to your back door! Thanks John! Bird feeding is very easy to do, and quite rewarding. Glad you like them, Ester! If I do the same thing, will birds come? Feed them, and they will come! A plate of roasted peanuts — I think I can do that 😉 Thanks, Hien. So adorable! Thanks for this treat, Neihtn. Thanks Amy. 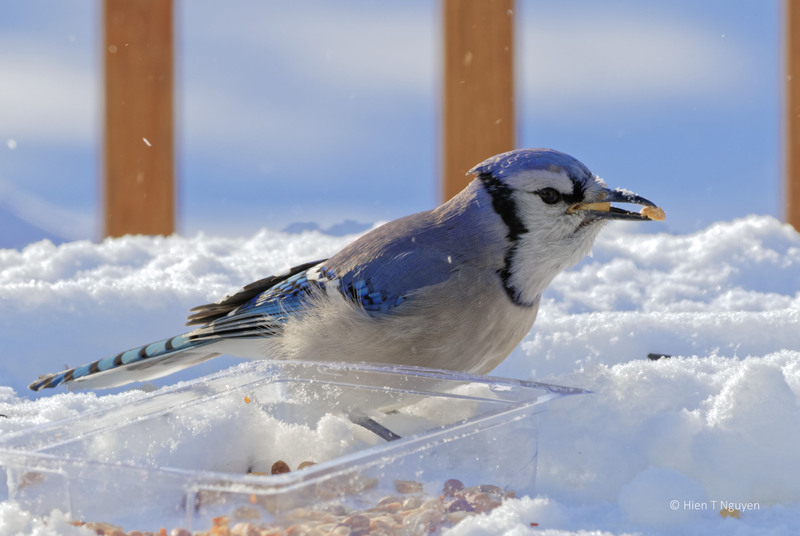 Blue Jays are forever hungry. They tend to hoard their food in secret places, then sometimes forget about them. Ha, ha, very true Lois. 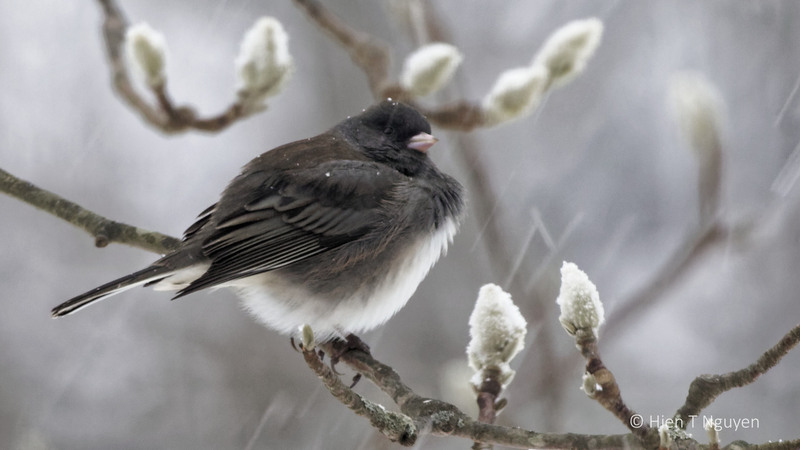 But that Junco was mostly fluff.